Plant biology is exciting, so explore how plants mature from a tiny seedling into a full foliaged adult. Put horticulture in motion by trying it out in a fun (and tasty) project. Learning how plants grow is an important part of any gardener's education. Can Plants Grow Without Soil? 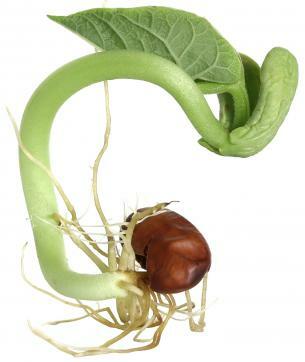 Plants that reproduce via a seed do so in a process called germination. The embryo waits inside the seed (some plant embryos can wait for decades) until outside conditions begin to break down the seed's outer shell or testa A seed needs water and heat to germinate. Water assists the seed in breaking the seed coat, which in some cases can be very tough. Corn and morning glory seeds have a very tough seed coat and need to be soaked in water before they are planted. 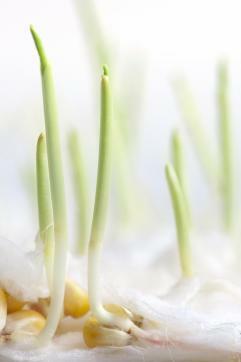 The seed begins to grow as it absorbs the moisture triggering the cells and enzymes within the seed to multiply. As the encased embryo turbo-charges metabolic processes, the seed is primed to release the first root structure (called the radical). Eventually, usually within a few days, the seedling bursts from its seed coat and will continue to grow both downward and upward. The "test/testa" is the outer husk or seed coat. The "hilum" sits above the divot in the bean seed. The hilum attached the seed to the pod. Water is absorbed into the seed (imbibed) through the micropyle. This structure is found above the hilum. The cotyledons, or first leaves, will be the first things you will see once the seedling has come out of the seed coat. Cotyledons are usually thicker leaves than the ones that will follow. The shoot of the plant may also be visible as the leaves start growing upward. Many plants, like corn and other grasses, are monocots - they only have a single cotyledon- the first food producing leaf. Bean and legumes have two of these, and are called dicots. As the shoot and cotyledons are pushing upwards, the taproot and smaller root hairs will also begin to grow. 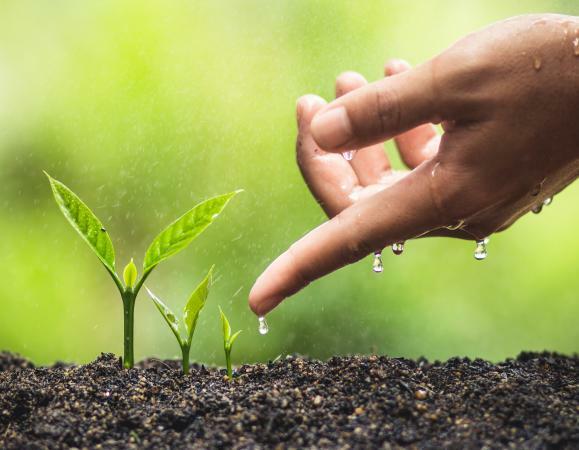 The proper soil, or water with the right nutrients, is necessary in order for the plant to continue growing. A plant can grow in most environments as long as it receives the proper nutrients required for growth. Plants can either grow in soil or in water (aquaculture). The first root has a specialized root cap that helps it to push downward into the soil. When the embryo first emerged from the seed/testa it sent out a root called the radical. The radical began the growth process by digging into the soil. This first root takes in nutrition and water allowing the embryo to "take off" on a critical growth spurt. Lateral root hairs and thread-like structures emerge from the central stem root. The root hairs also conduct water and nutrition into the uptake system. A plant root's center, the core or stele, are part of the circulation process. Inside are tubes that allow water and food to flow through the plant. For example, in the spring, sugar maple trees ramp up this circulation during warm days and cold nights. The liquid is called sap and this is what is collected to make maple syrup. 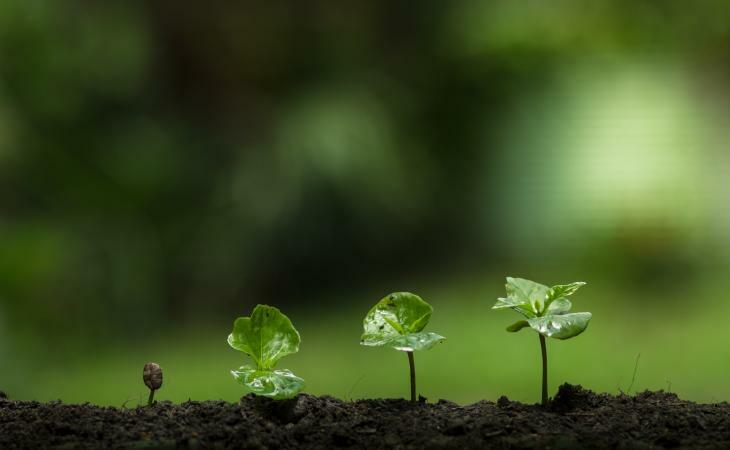 Once the roots have anchored the seedling, upwardly mobile growth begins. The plant has a firm footing and it is getting a ready amount of food and water - all of these will assist the building of the stalk (or stem) and the creation of adult leaves. 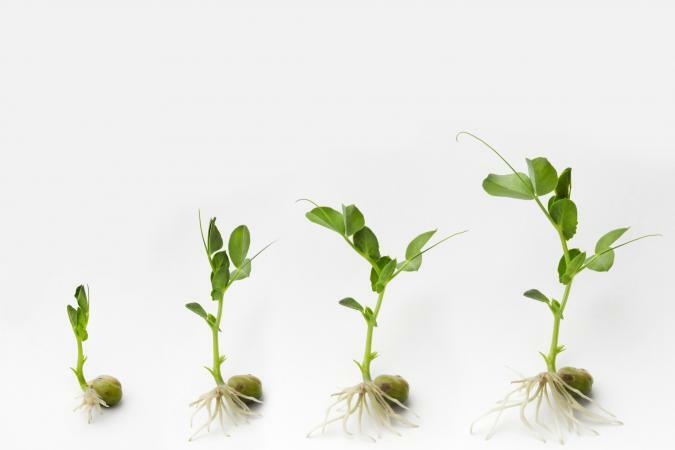 The plant will continue to grow upward and outward as its cells multiply. 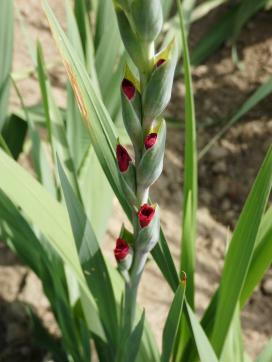 New leaves will appear, as will flowers in many plants. As the plant grows, it will continue to need the proper nutrients from the soil and water as well as sunlight or the right artificial light. Plants in good health will eventually reach their full height and maturity, which is dependent upon their specific variety. Once a plant reaches maturity, it will reproduce. Plants can do this in a few different ways that do not necessarily involve a seed. Plants with a male and a female reproductive system are in the flowering plant category. This is called sexual reproduction in flowering plants. Some plants, are hermaphrodites (have both male and female reproductive systems - like roses), others require a separate male and female plant that are near each other (like holly bushes or sea buckthorn shrubs) to reproduce. Flowering plants (hermaphrodite and male/female species) produce their "seeds" in a variety of forms from nuts to pods and fruit to underground storage containers- like peanuts! Grafting two plants together - Some fruit trees, like apples, or flowering roses, will not produce a similar variety from the fruit's seed (hybrids). In order to grow another Honey Crisp, grafting is essential for the fruit to be true to the original hybrid. 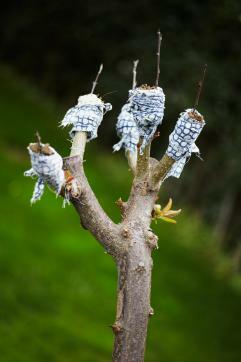 To do this, a budding stem is grafted or cut into the main branch of the host tree. Some roses are grafted to a standard root stock or stem. Runners or stolons - As seen on the strawberry plant, these runners send down roots that will assist in the formation of a separate plant! Adventitious buds - These buds are seen on the trunks of trees that have been cut down. Suckers - This is seen on Elm trees, pears, apples, tomatoes and roses. Bulbs - Plants like the onion, garlic and tulips reproduce by forming new bulbs. Egyptian/walking onions are masters of bulb reproduction. As the top bulb set matures, the weight causes the vertical stem to bend. The tiny onion bulbs rest on the soil and they soon begin to set root. A new walking onion begins to grow! Corms - Gladiolas and crocuses reproduce by forming new corms. Gladiolas are easy to grow. Simply dig the corms up before winter, save the new corms, store in a cool, dark area and then reset the corms in the spring. Tubers - Similar to bulbs, the dahlia and potato reproduce more tubers. The tuber is actually an enlarged stem. The potato is the king of the tubers. Potatoes grow from the eye that sits on the skin of the tuber. Each seed potato is cut into pieces - leaving an eye for each section. The piece is allowed to dry and then the seed potato is placed into the soil - eye side up. If you'd like to see for yourself how plants grow in a controlled environment, consider starting corn plants indoors. Corn loves warm soil to germinate and this can hamper folks living in cold areas from getting a good early crop. Forcing corn seeds a few weeks before outdoor planting begins is a great way to be the first to get tassling in your neck of the woods. Fill each of the egg cups 3/4 full with seed starter soil. Soak the corn seeds in tap water for a few hours. Plant the seeds in about a half-inch of the dampened soil mix. You will be able to see the corn kernel, or part of it, through the side of the container. Water the soil so that it is moist, not drenched. Place the container in a warm, sunny window and wait for the seeds to germinate. In a few days, you should be able to observe the corn seeds begin to germinate and shed their seed coats. The coleoptile (sheath covering the first leaves and stalks of grasses) will be visible as well as the beginnings of the shoot and taproot. The plant will continue to grow and you'll be able to watch the plant reach for the sunlight (phototropism). The taproot and root hairs will also continue to grow, pushing further into the soil in search of water. With a degree of care, tease a corn seedling from the dirt. You can look at the root formation by gently swishing the seedling in a bowl of water to loosen the soil. The corn can then be planted immediately in the garden - do not allow the seedling to dry out. Carefully transplant the corn seedlings outdoors. Corn does not like to be transplanted or disturbed, so be extra gentle while transferring the seedling into the tilled soil. When your germination experiment reaches the reproduction phase (corn are hermaphrodites), those familiar tassels appear at the top of the stalk. Corn are pollinated by the wind! The tassel drops pollen onto the silk atop each ear. Every silk will form the seed called a kernel. Enjoy those kernels when the tassels turn brown and the ear is plump. Use the fascinating process of plant reproduction in your yard. Gardening is a lifelong hobby that feeds the body and invigorates the mind.